Almost 2 years ago when I was wondering how to add some Bible and devotional content to our homeschooling days, I borrowed this lovely book from a friend. First off, I am a big fan of borrowing books/curriculum before making any purchases whenever possible! And it’s great to borrow from a friend who can share their experiences with a product to help you decide if it is a good fit for you. I had been really appreciating Sally Clarkson’s ministry through her blog and her book, The Mission of Motherhood. She references her husband’s book and these Clarkson family “ways” in various places in her blog and books. So I borrowed my friend’s copy of Our 24 Family Ways and thought it looked great! When my oldest was younger, I felt that reading a picture Bible (we use The Jesus Storybook Bible) and memorizing verses was sufficient. As she got older though, I wanted to move beyond just the “Sunday school stories” into more Bible study and character training. This book seemed perfect for that, and even has colouring pages to go along with each lesson. So I purchased my own copy, and we have been using it for about a year and a half now. We are currently on Way 15 of 24. 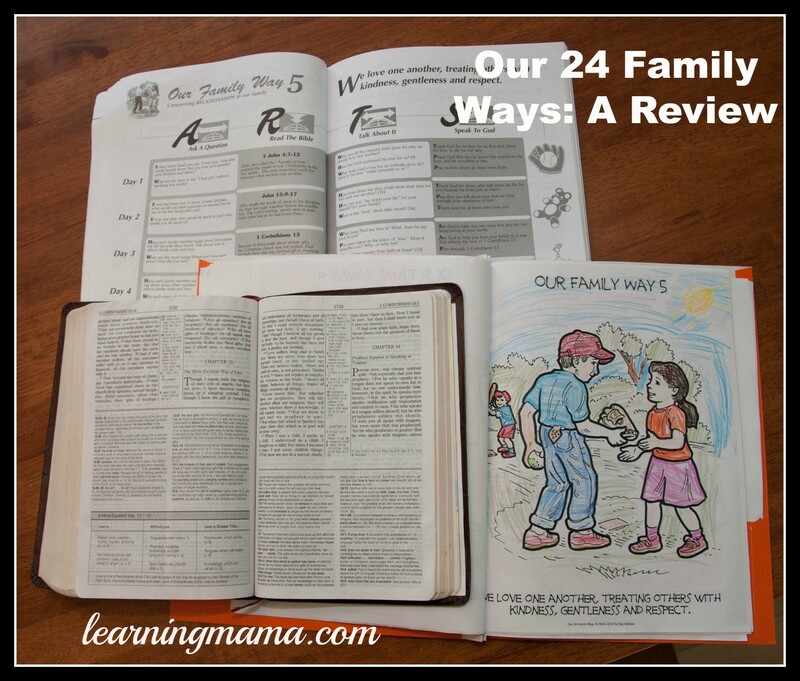 Our 24 Family Ways is written by Clay Clarkson, who along with his wife Sally, founded Whole Heart Ministries. I also have a copy of his homeschooling book Educating the Wholehearted Child which is on my list of books that I have found most influential in my own homeschooling journey. The book’s layout is simple, with each Family Way having a picture, a story and 5 days of scripture readings and ideas for discussion questions, conversations and praying. A – Ask a Question: suggestions for questions are included each day to stimulate discussion and gain interest. R – Read the Bible: Bible passages applicable to each day’s topic are chosen to read aloud. T – Talk about it: Questions are provided in relation both to the scripture’s content as well as life application. S – Speak to God: Each day is completed with prayer. We’ve really enjoyed using this devotional! We bought my oldest daughter her own Bible last year, and she has had some practice looking up the verses, and she usually asks if she can read the passage aloud for us. I really love to see her growing and learning like this. It has also been adaptable for even Little Sister who was three years old when we started. She still doesn’t participate much with the Bible reading and discussion, but she is memorizing each of the ways and enjoys colouring the colouring pages. I really like the Family Ways and have found memorizing them to be quite useful for training and correction throughout the day. I find myself saying “Big Sister, we use that build up and bless others” or “Little Sister, we treat others with kindness, gentleness and respect” and the girls knowingly nod their heads because they understand and remember those lessons. While we did step away from our circle and Bible time when things got crazy here last spring with the birth of Baby Sister, things are settling down and we are getting back to a more regular routine again. We picked up where we left off with Our 24 Family Ways a few weeks ago and are enjoying it again! As we are nearing the end of the devotional, I am already starting to look around and see what is available for us to dive into next. I’ve briefly looked at Grapevine Studies, and think my girls might enjoy “Stick figuring their way through the Bible” but I definitely think we will come back to Our 24 Family Ways when Little Sister is older and Baby Sister is old enough to join in! What about you? Do you have any suggestions for Bible studies or devotionals suited to young children? I’d love to hear about what you like and why! This post contains affiliate links. I purchased this book myself however, and have not been compensated in any way for this review. It is my own honest opinion. Thank you for your review! I actually have this book on my shelf (also borrowed!) and have not started using it. This is mostly because we are happy with our circle time routine right now, but I think this might be helpful to start to build some good habits. Right now we read a passage from our “Family Bible” (ESV…it takes short story passages directly from Scripture) and SA(6) narrates, then we say our memory verse (always a passage in context..almost done working on psalm 103 right now), sing our memory hymn, and pray. Your circle time sounds lovely! We’ve occasionally sung hymns together during our circle time, and I love it. Thanks for stopping by! I just found your blog and am enjoying reading through your posts. I read through a lot of your posts on narration and copywork yesterday and was encouraged by them. I try to have my boys do copy work every day, even if we don’t get to all our other school work in the day. It’s so important! I’ve really been wanting to incorporate a morning time to our days though so this was a perfect post to see this morning. I have the 24 ways book in my home library. I have looked through it briefly myself but I think I’ll get it out now and start using it with my three boys (10, 8, 3) in the mornings while the baby has a snack. I’m so happy that you have found my posts encouraging 🙂 I think 24 Family Ways would work wonderfully in a Morning Time, I hope you are blessed by it!